Think of this North Africa adventure as the best hits album of Morocco, full of all the classics you could wish for, with a few bonus features thrown in. We’ll ride across the Sahara on camels, stopping for sundowners over the blazing dunes before sleeping beneath the stars at our luxury glamp site. We’ll hike the Atlas Mountains, pausing for lunch with local Berber families and drinking fresh mint tea on rooftop terraces. In the cultural explosion of Morocco’s vibrant cities, we’ll take a secret foodie tour around Marrakech, dine like a local in Fes and channel Game of Thrones in ancient Ait Benhaddou. Then prepare to experience the dreamlike beauty of the Blue City of Chefchaouen, all whilst staying in charming hotels with inviting pools and amazing hammam spas. Strap in for an epic road trip of mind-blowing scenery, on the ultimate Morocco escape. This high-end camp brings together the raw beauty of the Sahara with home comforts such as plush beds, hot water bottles, modern showers and plenty of furniture to lounge about on. Desert hikes, quad biking, yoga and camel rides are all on offer but you’ll be equally happy under canvas, sampling the chefs’ authentic Moroccan dishes, and then venturing out at nightfall for a spot of stargazing. Sink into luxury Marrakesh-style in this modern, chic guest house. Fully equipped with a spa and hammam, this hotel puts wellness right at the centre of its experience. Unwind in style. Blending modern interiors with traditional craftwork, this is contemporary urban elegance at its most refined. Located at a stone’s throw from the city centre, with an al fresco swimming pool that is yours for the taking, this is the perfect city hide-out. What a hotel! Traditional Moroccan design has been given a modern, luxury makeover here, with muted colours, large walk-in showers, luxurious toiletries and Moroccan pottery. You won’t want to leave your room but you should. The highly regarded Givenchy Spa is a wonder, with its hot tub, twinkling green tiling, wall-mounted water jets and five treatment rooms. Don’t check out without experiencing a massage. Touch down in the whitewashed city of Casablanca and grab your shades, ready to be dazzled by a ream of exotic delights. The largest city in Morocco is a dynamic blend of old and new, with art deco facades, towering skyscrapers and the shimmering Atlantic Ocean. Take a private transfer to your hotel and acclimatise to your new surroundings. Come evening, it’s time to let the Flashpacking fun begin. Meet your guide and fellow Flashpackers at 6pm and then we’ll head out for dinner. Get to know your fellow Flashpackers as you tuck into a Moroccan feast. Saddle up for the first full day of your Moroccan adventure. Today we’re hitting the road out of Casablanca and travelling seven hours north to Chefchaouen. The ‘Blue City’ is one of the prettiest spots in Morocco and a photographer’s dream. 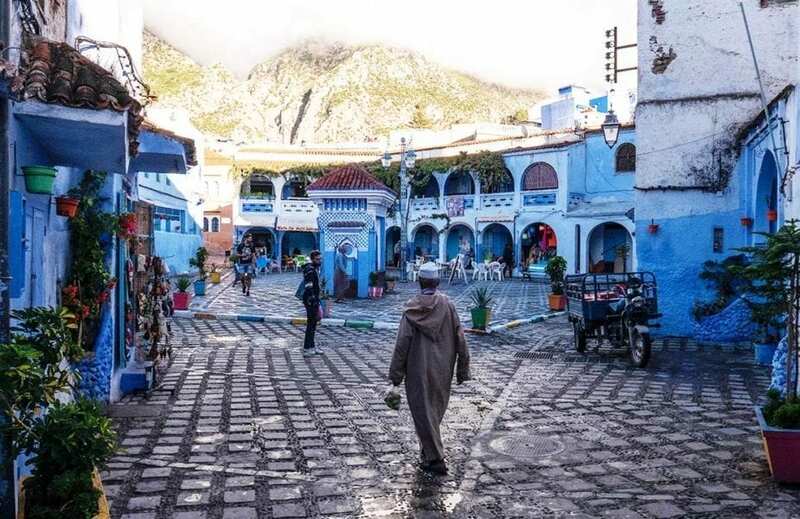 Nestled between the striking peaks of the Rif Mountains, here you’ll find a stunning medina of azure-blue walls, white-washed houses and decadent doorways. Rebuilt by Andalusian refugees escaping the Reconquistia, you’d be forgiven for thinking you’re in a Spanish hilltop town as you wind your way through the charming cobbled streets. Come evening, wander through the city with your fellow Flashpackers in time to catch a dreamy sunset over the hills. Then dive into one of the delightful restaurants to feast on delicious Moroccan flavours. Today is yours to explore as you please in this laid-back city, whether you’re discovering secret archways, getting a henna tattoo or mooching through the colourful shops. There are also plenty of hammams to indulge in, or you could simply head for a café and watch city life unfold. Alternatively, take a hike through through the stunning scenery, winding your way towards Akchour waterfalls. While this is not officially part of the itinerary, feel free to explore the waterfalls with your fellow Flashpackers – the shimmering forest pools are well worth the trek. Kick back and relax with water cascading down above you, feeling your cares fade away in the bright Moroccan sunshine. Back in Chefchaouen, such a picturesque place was made for alfresco dining, so be sure to hit up a local restaurant for dinner; we hear the goat’s cheese is a regional favourite. This morning we’ll travel four hours south to the historic city of Fes, passing rolling hills and olive groves that seem to stretch on forever. We’ll stop at the archaeological wonder of Volubilis to admire the pillars and archways of this former Roman capital, discovering the beautifully preserved mosaics along the Decumanus Maximus. Next up, it’s Fes. Prepare a sensory overload in this noisy and vibrant city, bursting with unusual flavours, an endless labyrinth of streets and donkey carts packed with colourful goods. Check into your luxury hotel and head straight to the hammam after your long drive. Dinner is then served in true Fes style, with signature pastille at a local restaurant. Pastille is essentially filo pastry stuffed with chicken, almonds, onions and covered with a sprinkling of cinnamon and sugar (veggie options are available, too). Feel every inch a local as you tuck in and embrace this local delicacy. Wake up in the splendour of your luxury hotel, ready to embrace city life. This morning we’re going on a history-packed walkabout through the old city of Fes, known locally as Fes el Bali. This medieval city is home to the mother of all medinas. This souk is alive with haggling markets, talented craftsmen, snake charmers and echoing mosques, all set against a backdrop of intricately-tiled archways and sand-colored rooftops in every direction. You’ll feel as though you’ve stepped back into the Middle Ages, as you wind through one of the largest car-free urban zones in the world. Afterwards, you’ll have a free afternoon to explore this exotic city; don’t miss the newly restored Madera Boo Inanna, which has only recently opened to tourists, and the famous Chaouwara Tannery, with its iconic view overlooking the colourful dye pits. Finish up by kicking back at your charming hotel and spa – anyone for an argan oil massage? Have your bucket lists at the ready today as we travel deep into the desert to the spectacular beauty of the Sahara. Watch the Atlas Mountain scenery gradually gives way to arid flatlands on our five-hour drive, before we arrive in the Saharan village of Merzouga for mid-afternoon. With the vivid orange sand dunes of Erg Chebbi rolling out for miles, you’ll feel wonderfully isolated from modern life here. Celebrate by saddling up for a sunset camel ride, amid Bedouins strolling across the sand and the twinkling lights of your luxury glamping site on the horizon. Ride across the vast desert panorama as the dunes light up beneath the blazing skies, and stop for a sundowner or three without a tourist in sight. Your desert home for the night looks fresh out of a film set, with boutique tents filled with the flickering glow of candlelight. A delicious dinner made by a private chef awaits, with live music rolling across the dunes and a night of dancing beneath the stars. After an alfresco breakfast in the rolling dunes, it’s time to swap the Sahara for the epic scenery of Todra Gorge. We’ll drive for five hours through the foothills of the Atlas Mountains to reach this vast canyon, where sheer rock walls reach up to 300 metres high. We’ll weave our way through mud-brick villages perched on the hillside to reach our hotel in the Todra Valley. Put your feet up and relax in this atmospheric retreat and one-time kasbah. You could do a few laps in the palm-fringed pool, or head up to the terrace to take in sumptuous views of rocks sculpted by the wind, and lush green valleys dotted across the terracotta plains. Make sure you load up on moreish Moroccan cuisine ahead of our epic hike tomorrow. Lace up your hiking boots today for a trek through Todra Gorge and the mountains beyond. With your expert guide leading the way, you’ll trek along a beautiful circuit route for 10 kilometres across the undulating valley. Passing through remote Berber villages, enjoy this glimpse of authentic life as you meet friendly locals and share fresh mint tea along the way. You’ll see the famous Rose Valley glowing in the distance and jagged mountain peaks all around. For lunch, you’ll be welcomed into the home of a local Berber family, who’ll put on a spread of delicious traditional dishes. Tuck into this well-deserved feast and share stories with your hosts getting to know what real life is like up here in the mountains. Afterwards, we’ll head back out into sunshine of the Todra Valley and make our way back to the hotel. If you’d prefer a shorter hike through this stunning scenery, there is also an alternative five-kilometre hike we could tackle as a group instead. Either way, the hotel pool is ready and waiting for you when you return, or a book in for a relaxing hammam massage to soothe those weary muscles. Today we’ll cruise the fabled “Road of 1000 Kasbahs”, driving four hours west to Ait Benhaddou. Along the way we’ll stop at Skouras Oasis, a scenic palm grove scattered with privately owned kasbahs. We’ll also take a look at Kasbah Amridil, a 17th century fortress. Finally, we’ll arrive in the fortified city of Ait Benhaddou, a mud-brick wonder perched high in the cliffsides. Dating to the 11th century, this clay architecture city comes with a long list of film credentials, including Lawrence of Arabia, Game of Thrones and Gladiator. We’ll walk in the footsteps of Hollywood greats with a wander through the winding streets of the old town, making our way to the top of the hill for amazing panoramic views across the surrounding plains. From here, we’ll carry on to our hotel, where you can kick back on the rooftop terrace and watch the sun setting over the magical kasbah. No trip to Morocco is complete without embracing the exotic sights of Marrakech, so this morning we’ll drive for five hours through the winding Atlas roads to reach this enchanting city. Here, ancient history collides with European modernity to create a unique city steeped in rich culture. We’ll embrace this to the max with flavour-packed foodie tour, discovering the best hidden food spots tucked away from the tourists. We’ll haggle our way through the colourful souks, weaving past cobras in baskets and endless beating drums. From local olives to dried fruits and fresh pastries, we’ll try a host of Moroccan street specialties, and we’ll pop by a local spice market to get the lowdown on fiery Moroccan flavours. Tastebuds dazzled and recipes noted, we’ll then carry onto our charming hotel for the night. After a day getting your step count soaring, the hammam here has got your name on. We’ll kick off this morning with a walk around Marrakech’s old medina, mooching between the bustling markets that are the lifeblood flowing through the city. Next, we’ll grab a slice of serenity at Le Jardin Secret. Less known than Majorelle Garden, but equally as beautiful, this ornate palace complex boasts designs that date back 400 years. We’ll then carry on to the Photography Museum, a former palace that’s home to an awesome collection of Moroccan art and sculptures. After admiring the iconic Koutoubia Mosque, we’ll wind back through the streets of the old medina to the lively Djemaa el-Fna Square. Spend the afternoon stocking up on amazing bargains to squeeze in your suitcase home, and take your pick of the restaurants lining the square for a farewell dinner with your fellow Flashpackers. It’s your last night in Morocco, so get the drinks in and raise a glass to your whirlwind adventure. Heading home or climbing mountains? Fly into Mohammed V International Airport (CMN) and fly out of Marrakech Menara International Airport (RAK).